During late December 2012 and early January 2013, a "Dome of Heat" weather pattern formed over the Australian mainland. The "Dome of Heat" is a stationary hot air mass over the Australian continent that continued to increase temperatures across the country. 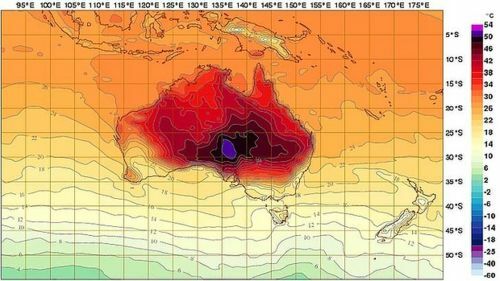 The Australian Bureau of Meteorology extended its interactive weather forecasting chart with new colours – deep purple and pink – to extend its previous temperature range to 54C. The upper heat range was previously capped at 50 degrees. Australia's first six days of 2013 were all among the hottest 20 days on record in terms of average maximums, with January 7 and 8 adding to the list of peaks. This resulted in four of the top 10 hottest days in Australia in a little over a week. a bushfire forecast of "catastrophic level" in several regions across New South Wales, and 130 resulting severe bushfires, many started by lightning. A catastrophic fire warning was issued for four areas in southern New South Wales, including the Northern and Eastern Riverina, the Illawarra Shoalhaven, and the Southern Ranges. Early estimates say the fires, which now burnt out more than 345,000 hectares of the state, have caused $1 million in stock losses, including the death of 10,000 sheep near Yass. "The current heatwave – in terms of its duration, its intensity and its extent – is now unprecedented in our records," the Bureau of Meteorology’s manager of climate monitoring and prediction, David Jones, said. "Clearly, the climate system is responding to the background warming trend. Everything that happens in the climate system now is taking place on a planet which is a degree hotter than it used to be." As the warming trend increases over coming years, record-breaking heat will become more and more common, Dr Jones said. Australia's record maximum is 50.7 degrees reached at Oodnadatta Airport on January 2, 1960. On 7 January 2013, Australian Prime Minister Julia Gillard underscored the dangers facing Australia this summer from climate change as she saw Tasmanian bushfire ruins, and warned people to expect more. Ms Gillard said New South Wales faced potentially catastrophic conditions on Tuesday, and the crisis was not over in Tasmania. Ms Gillard said extreme bushfires were part of life in a hot and dry country. "And while you would not put any one event down to climate change ... we do know that over time as a result of climate change we are going to see more extreme weather events," she said. This page was last modified 22:30, 15 January 2014.